Learning to sail is like opening the door to a new world, sometimes challenging or difficult, but incredibly rewarding, for you, and for us. 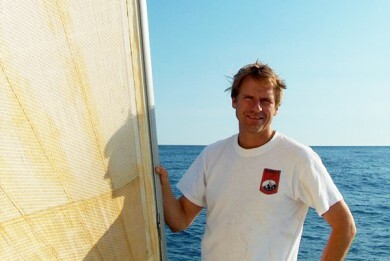 There is nothing like the excitement of your first solo sail, or your first offshore passage. That’s why we teach sailing. Sure, you can learn something in a long weekend. One month later, you’ll forget most of it. You retain and internalize much more if classes are spread out over several weeks. Take the time to learn sailing properly, and you’ll enjoy sailing and feel far more confident as a result. Many schools teach a 15-20 hour Keelboat program, and say you’re ready. We first focus on basic sailing skills, such as tacking, jibing, and sail trim, before we move on to more advanced skills like reefing, man over board drills and docking. Intro to Sailing has two 5 hour courses over one weekend, Saturday and Sunday, or two saturdays one week apart, to provide a good foundation for beginners. Once you can sail, we teach you how to be a skipper. The most difficult part of this is learning how to watch the sailtrim, charts, depth, and look out for other navigation, all at the same time. This takes time and practice, and with 20 hours on the water, you’ll get it. We also cover topics most schools don’t even touch, with lots of docking practice including sailing into a slip, running aground and kedging off, anchoring and reefing. 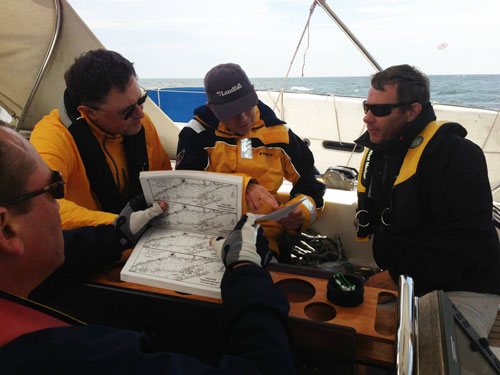 Basic Keelboat has four 5 hour courses over two consecutive weekends. Or, call for weekday classes. We offer more time on the water. Classroom time to review textbook material won’t make you a better sailor. 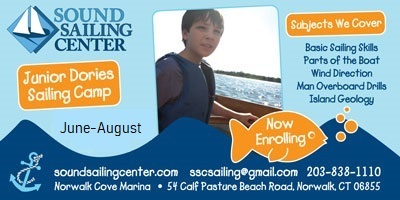 At SSC, close to 100% of Intro to Sailing or Basic Keelboat is on the water. 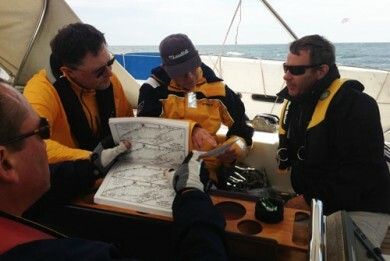 Question and answer sessions occur while out sailing. Your (and our) time is valuable, and we work hard to make the most of it. We do expect you to read and study the provided texts in Basic Keelboat. When we started teaching in 1995, we had four students per class, like most other schools. It’s more profitable, and our boats are more than big enough. However, we found student preferred and performed better with 3 students per class. When not at the helm, you’ll be working on navigation, sail trim, and textbook questions, but primarily, you’ll be watching and learning from mistakes made by the student on the helm before you have a go at it. You’ll typically be on the helm 3-4 minutes practicing each drill, like single-handed tacking or reefing. With four students, you would be ‘off watch’ for about 9 minutes per drill session, which is too long. With three students, you’ll be ‘off watch’ for about 6 minutes, which makes a difference. Bottom line; at SSC you get 25% more time on the helm. We are perhaps the only school in the county who’s entire fleet is specifically set up so students can easily singlehand. Even on our Ensigns, features like the electric motors, roller furling jib and self flaking main with a low friction track system allow them to be easily sailed singlehanded. You can can reef, start and run the motor, tack, roll up the jib and drop the mail, all from a safe seated position in the cockpit within a foot or so of the tiller. Although this requires an investment of over $5,000 per Ensign and some innovative teaching methods, sailing singelhanded is simply the greatest skill and confidence builder there is. Teaching boats should be strong, comfortable, and responsive. Many sailing school boats are impossible to singlehand, too light for docking and running aground practice, or designed for children or racing. Our Ensigns are true classics, easy to singlehand, strong, safe and responsive yet forgiving. Ask any old salt. Even our Advanced Cruising and Ocean Sailing boat, a Hanse 400, is an excellent boat for ocean sailing and teaching. Finally compare equipment lists. It’s hard to learn about essential gear like innerforestays with storm jibs, SSB radio, weatherfax, or watermakers if the boat does not have them. Even our Ensigns have depth recorders and VHF radios. Does the school encourage you to take out their boats at the end of the class? Will they let you do it single-handed? At Sound Sailing Center, practice time is included in our Basic Keelboat course. It’s interesting that most schools will not let you take out their boats alone after you have completed their Basic Keelboat course. Many of our students join our membership program after completing the course, and enjoy sailing a variety of different boats. Since so many of you will be using our boats, we have a rather large incentive to make sure you are well prepared. You will benefit by becoming a far more knowledgeable sailor after one or two years of captaining our boats. 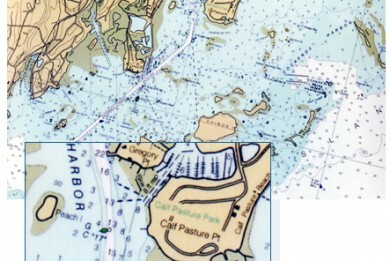 The Norwalk area provides over 30 islands, sandbars, reefs, tide, and a busy channel—every kind of hazard you might run into. By learning here, you’ll be comfortable sailing anywhere. Advanced Cruising adds, for example, night sailing on the Sound, which is difficult even for experienced sailors, while Ocean Sailing includes several days of true, blue water sailing in the Atlantic. Instructors are our most valuable asset. We get the best, because we pay more and because they like to be associated with a high quality operation. See our Instructors page for detailed information about all our teachers. All our instructors are adults who love sailing and are good teachers. Most have their own boats, are Coast Guard Licensed Captains and/or are certified by US Sailing. That’s also why we’ve made this the best program out there. Instructors are key, but we also have a great location, ideal boats, and we offer certification through US Sailing, the most rigorous program available. Students who really want to learn love us. 88 percent rated us excellent, and 100 percent rated us good or better. No course will make you a good sailor. Sailing entails constantly changing conditions and situations, so common sense and an appreciation of one’s limitations and abilities are essential. However, we will give you the information and skills you need. The rest is up to you. Look at the cost per hour of time at the helm, and the practice time included with Basic Keelboat and Basic Cruising. Our courses are the best value out there. We invite you to come in and look over our detailed analysis of other programs. To book a class, please pay a fully refundable deposit using our website or by calling in. Class dates are provisional until the class is filled (ie. 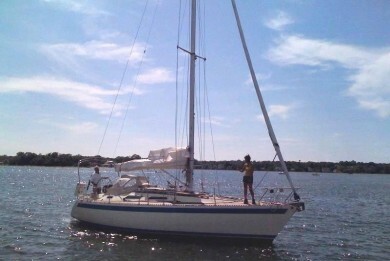 three students for Intro, Basic Keel Boat or Basic Cruising Class). If we run a class with two students the class time will be reduced by 20%. We will confirm or reschedule the class at least two weeks before the start of the class. Classes must be paid in full two weeks before the start of the class, or as soon as the class has been confirmed. Once the class is paid for, we will confirm and send you an email with your class handouts. Unless a medical emergency, classes may not be cancelled or rescheduled after they have been paid for. For medical emergencies, classes may be rescheduled up to one year later for no charge. There is no refund if you cancel a class after it has been confirmed, or are a no show, but we will give you a 50% discount on a replacement class good for one year. Missed classes must be made up with private lessons. A five hour class can be covered in a three hour private lesson. Our normal rates for private lessons apply, but we normally do not charge for the boat.